The Larson collection details various photographs of Cassius Leland McLeod and his family, who lived near Dannebrog, Nebraska. 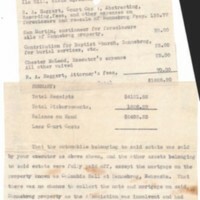 These are photographs of receipts of disbursements for C. L. McLeod. 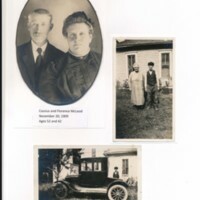 This is a photograph of three photographs of Cassius and Florence McLeod. 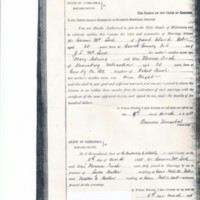 This is a photograph of the copy of the couple's marriage license from March 11, 1888. 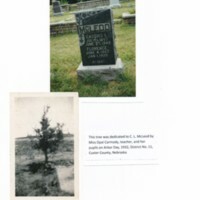 This is a photograph of the couple's gravesite and a tree planted in their memory. Miss Opal Carmody, teacher, and her pupils dedicated the tree on Arbor Day, 1932, District No. 11, Custer County, Nebraska. 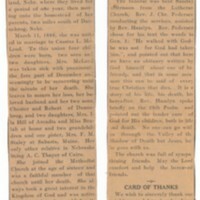 This is a photograph of a newspaper clipping of the obituary of Mrs. Florence McLeod.